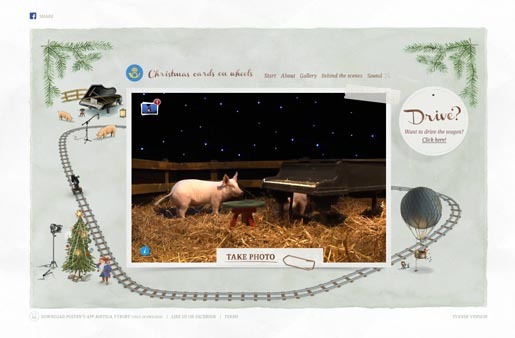 Swedish Post (Posten) has launched Christmas Cards on Wheels, a site (xmasonwheels.com) inspired by the traditional Christmas cards designed by Jenny Nystrom. Visitors to the site can take live pictures of pigs, Santa Claus, Santa’s little helpers and other Christmas elements such as Christmas trees. The photos are then sent as real Christmas cards to friends and family. A live camera moves between different living motifs allowing visitors to take an endless variations of photos. Site users can also choose to be the driver of the “train” and decide what should happen in the live surrounding. Filming was produced at It’s Showtime, Stockholm, with local production by Kalmar Scenteknik & Kalmar Mediespecialist. Web design was by From Stockholm With Love, Stockholm.